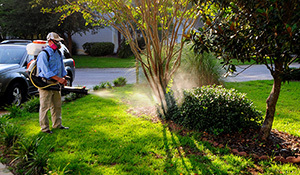 The Pest Control Yard Service performed by our trained technicians includes a thorough inspection of your lawn to identify and evaluate any trouble spots, a recommendation best suited for your lawn’s specific needs and then treatment of the lawn with the most effective and environmentally responsible solution available on the market today. The recent rain and warm weather is going to cause spiders, and other insects to swarm around your house and yard. In order to keep these pesky critters away from your outdoor fun, we are offering special pricing for our yard service. This yard service will treat your lawn, bushes, and trees for 85 annoying pests including ants, and spiders. Please contact us at 1-866-430-9801 if you are interested in scheduling this service. You can also receive an additional discount for this service by Liking our Facebook Page and downloading the $20 coupon. We appreciate the opportunity to service your home and we look forward to hearing from you. The Pest Control yard Service is designed to help control the most common types of lawn surface insects (see below). By targeting pests in the areas where they live and breed, our Pest Control Yard Service protects your family, pets and lawn against infestations. Treatment is effective for 30 days. Cost of the Pest Control Yard Service is based on 12,000 square feet of lawn. Contact your Sovereign Pest Control representative today for more details on this or any other service and to schedule an appointment for your next application.